Looking for summer decor ideas for your entryway and family room? See my home decorating tips and ideas on how you can add a fresh summery look to your spaces including beautiful summer color, decor accents, greenery, textiles and textures! 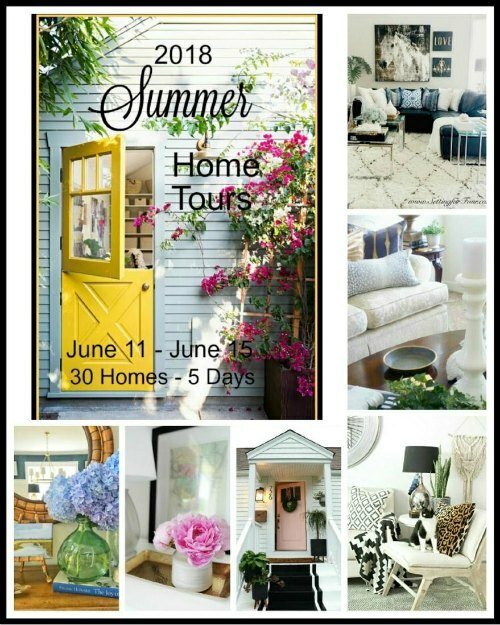 Today’s decorating post is part of the Summer Home Tours hosted by my talented friend Marty from A Stroll Thru Life! This week we are sharing with you 30 gorgeous summer homes over 5 days – lots of summer decorating ideas for all your indoor and outdoor spaces! 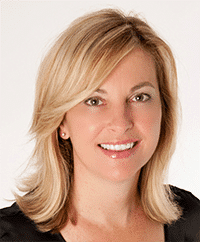 If you’re visiting from Tammy at Pink Peppermint Design – hello! I’m so glad you’re here and welcome! Isn’t Tammy’s summer home gorgeous? 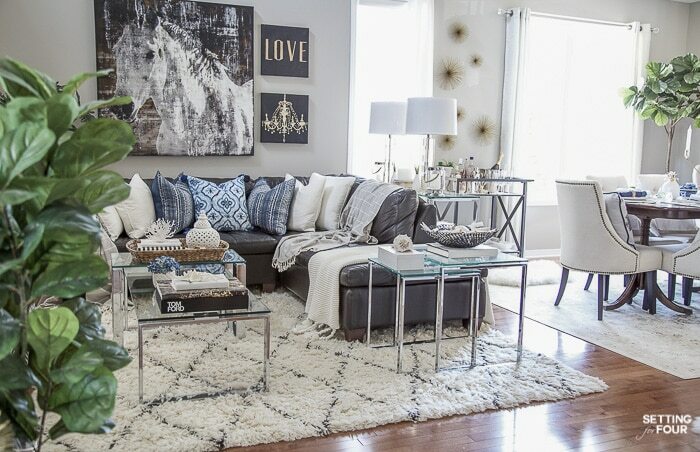 If you’re new to Setting for Four I’d love for you to hop over to my about me section where you can learn about my background as a proud military wife and how I moved from an exciting career as an Research and Development Microbiologist working for Fortune 500 companies to a full time Interior Decorator and Blogger with my own business! Being my own boss is just amazing and even though my path to this new career of mine was a REAL personal challenge and struggle (read all about that here!) I’m so glad that it led me to where I am today as a full time influencer and Interior Decorator! You can read all of my DIY home decor projects here and my Design and Decor Tips here. 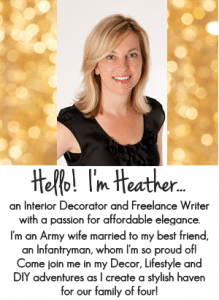 …and if you need some decor advice I offer online decorating services and e-design where we can work together through emails to solve a paint color problem or design a complete room! My most popular service is the one question design advice….where I’ll answer one question you have on paint color, room layout and more to get that nagging problem solved! Check out my design services here! It doesn’t take a lot of effort to give your entryway a summer look! 1. Color Palette Use a color palette that has a summery feel. You can use a light, fresh color palette or a bright, colorful one for summer….it’s your home, your choice! Since we spend more time outdoors why not use colors from mother nature? Choose colors from the garden, from the ocean or from your favorite summer destination….pick a color palette you love and use it in your entryway! Since we are beach babies and love to spend as much time as we can beachside by the water I used a beachy color palette with blues mixed with neutral summer gold and white colors. Add some seating to your entryway to make the space more functional and cozy! It can be a bench, chair, ottoman or a garden stool! I love my neutral tufted, high backed bench so much! It’s a great place for our family to sit down and put our shoes on and a place to set the mail on. Ikat patterns, shibori prints, floral prints, trellis patterns, and stripes mixed with solid color pillows are a great addition to a bench or stool you may have in your entryway. I replaced the faux fur pillows that I had on my upholstered bench with these navy and white ikat pillows. Replace heavier velvets and faux fur fabrics with linen and cotton. My blue throw blanket is a very light cotton and my pillows are cotton as well. This is where you can inject natural materials like mother of pearl, shells, sisal and wicker to your entryway for a summery vibe. I filled my ironstone bowl that you see on the shelf with shell orbs and abaca rope decorative spheres, but you can add displays of shells in a bowl or jar. Last summer I made a DIY starfish and faux coral coastal summer centerpiece that I displayed here. Adding wicker baskets and wicker lanterns to your entryway is another beautiful way to add summer style to an entryway. Terrariums are fun to use for summer since they can be filled with so many things! Add shells to them, succulents. little fern plants or simple add summery white candles like I did with my gold terrariums. 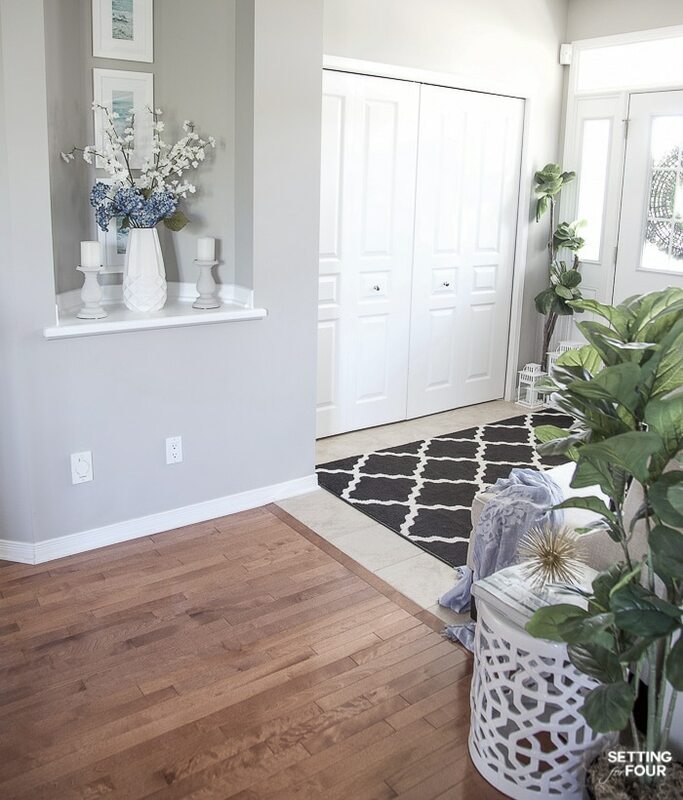 I kept my black and ivory trellis area rug in our entryways since it adds beautiful contrast to the space, hides dirt from shoes really well and it’s a classic, timeless trellis pattern that I love…. but you could add a gorgeous sisal rug to your entryway to create a summery feeling! See my entryway and family room go-to gray wall color that I absolutely love and all my paint colors here! I decorated the wall niche by our entryway with beachy art, and summery faux florals including white blossomy branches and blue hydrangeas. I love using fresh flowers but honestly, I think that faux flowers today look so life-like and are so gorgeous that I’m using more and more of them in my home! Case in point – the faux fig trees that I have in our foyer for a pop of greenery! Here’s another view of my summer entryway! Continue the color palette that you used in your entryway and add it to your family room to give a unified look to your home! I continued the blue and neutral color palette from my entryway by replacing the faux fur pillows I had here with my indigo blue shibori print pillows ( similar here ). I mixed them with my white cotton pillows. I have a ton of pillows and rotate them for the different seasons. The pillows I’m not using I store in these genius storage bags which shrinks them flat. Then I store them in our guest bedroom closet! Again use shibori, ikat, florals and stripes to add a summery vibe to your family room. Awning stripes and pin stripes are classic summer looks and widely available in the summer. Linen and cotton fabrics are cool and breathable making them perfect for summer! They are also visually light and airy. My pillows are all cotton and I recently added these gorgeous Belgian flax white linen curtains ( they come in ivory and slate gray too! I bought them with lining for a bit more structure) and these beautiful antique brass curtain rods to our family room! Use succulents, sisal and natural grass baskets, coral, shells and driftwood to your family room for summer style. I placed a large shell on the side table. I also added coral and starfish to our coffee table. This faux coral is actually a DIY Pottery Barn knockoff that’s a cinch to make and fun to add to mantels and bookshelves too! Bring in some summer flowers from your garden or seasonal flowers from the grocery store! I love blue hydrangeas so I added them to my family room to repeat the blue color palette. Sometimes I add arrangements of summer wildflowers that I pick up from our local trail. Adding a gorgeous sisal rug or a striped rug will instantly inject a summer feel to your family room. 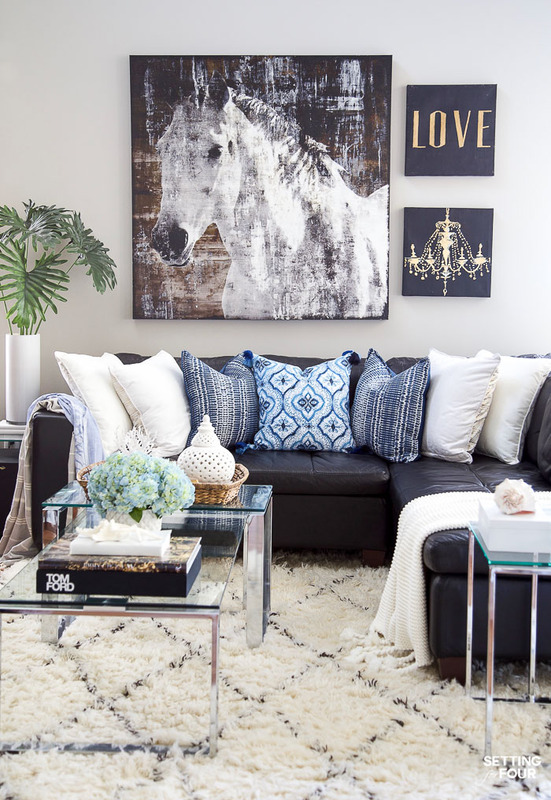 I kept our beautiful Moroccan shag area rug the same for summer because it’s classic ivory and black color palette works really well with the white and indigo pillows I used! I’ve had a lot of questions about this Moroccan shag rug and how it holds up to a family’s use – it’s very durable and we love it! I spilled a big cup of black tea on it once but it came right out with this rug stain remover and cleaning trick that by trial and error I discovered works perfectly for removing dark stains! Here’s a wide angle view of our open concept family room and dining room. Our entryway opens onto this space as well, so it’s important to use a unified color palette that flows and connects all these rooms. 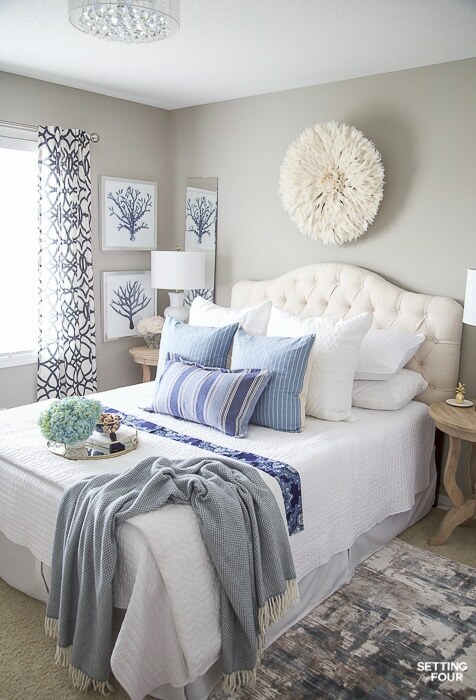 ….and for more summer decorating tips check out my 7 Simple Summer Bedroom Decor Ideas and Refresh that I recently shared! I hope you enjoyed my Summer Decor Ideas For Your Entryway And Family Room! Now grab a cup of coffee and head to Brooke’s Summer home tour at Nesting With Grace for more gorgeous summer home decorating ideas! 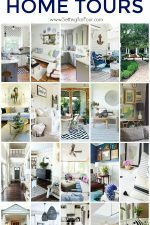 Great summer styling tips and gorgeous photos of your home! Always a treat to visit!!! Have a fun summer at the beach! 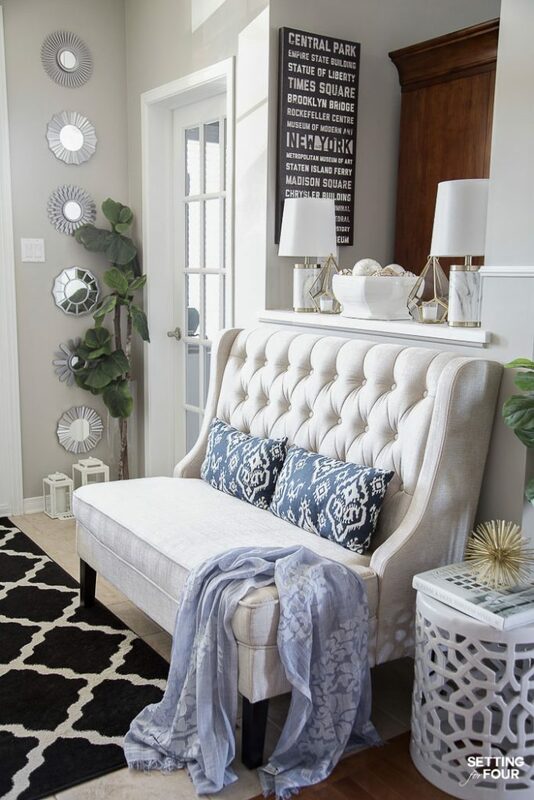 I love how you use a fabulous settee in our entry, so pretty and how nice to have a place to sit down, put on or take off shoes and dump your purse and all those packages. Such great advice about summer accessories too. I love your pretty home and you know that your horse painting is one of my favorites. Thanks so much for joining the tours, I am always impressed when I view your home. I love your home! I wonder if you could tell me the color of paint on your walls in the entry? Such great tips Heather! I love all the blue in your home. I’m all about blue right now. Thank you for sharing such wonderful tips, Heather! Your summer color palette feels so fresh and clean. Fabulous ideas, and I am loving your beautiful blues! I agree with you about the realistic look of faux plants and florals these days. They are really beautiful and no maintenance! I have a couple of faux olive trees by my fireplace and I just added a faux ficus tree to my dining room which you will see on the tour. I was thinking about putting smaller plant beside the ficus, and I really like your fig trees! Everything looks so perfectly pulled together! Have a great summer! Absolutely gorgeous!!! I’m kind of obsessed with blues these days so your tour was a total treat! This looks so beautiful and fresh! I love your tips and that entryway…oh my! It’s gorgeous! I wish I could have an entry like yours where I could accommodate a nice comfy bench. Love it! All your rooms are magazine worthy. 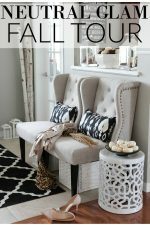 Beautiful home tour and great tips. Thanks! 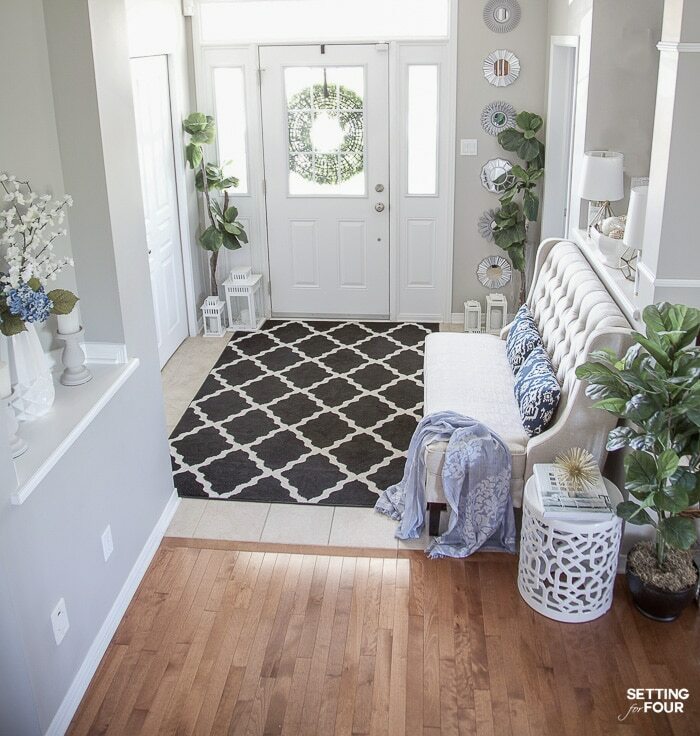 Your summer entryway is gorgeous, Heather! Love that rug!!! Hi Heather- your home is always so stylish and pretty. Had no idea on your background till this post. that’s quite a career transition. Happy summer to you! 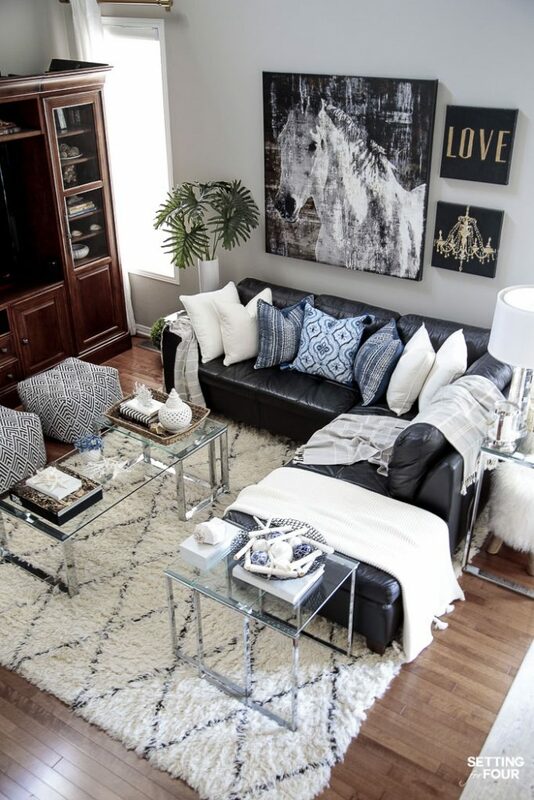 Heather, your family room is stunning! I love your contemporary touches but it still maintains a cozy elegance. Looking forward to joining the tour later this week! HI, Heather I tried to comment on Monday, but the box wasn’t working for me! Your home looks so cozy and inviting, beautiful job as always. Fun to be in the tour with you! Love all of your ideas, Heather! Oh my goodness… everything is stunning! I love it Heather! Thank you so much sweet friend!! Happy Summer Karianne! These are amazing decorating ideas! I love the extra seating in the hall with the grey and white rug! Thank you for your lovely compliments Isabella! I’m so glad you like my summer decorating ideas! The room with the leather couch is so amazing! I hope one day I can have a room just like that! haha. those are some amazing pieces of furniture. Fabulous! 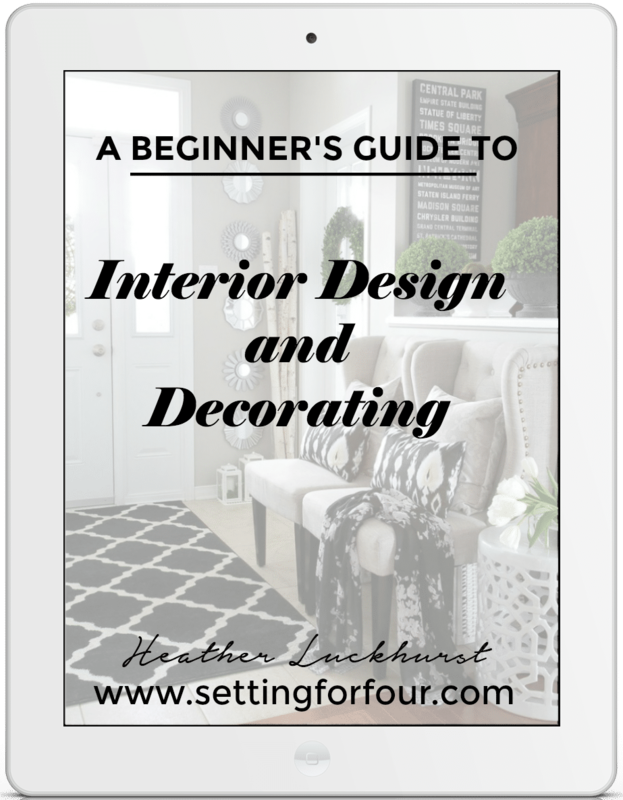 I’m glad you like my decor tips and found some ideas that you will use! Thanks for visiting and commenting John!! These rooms are absolutely breathtaking! I’m crazy about the horse picture! Thanks for all of the tips. love all the summer decorating ideas! thanks! You’re welcome Winnie! I’m so glad you like them!